After twenty years of archaeological field work, artifacts remaining at the DNR's Kolb archaeology site will be preserved in place for researchers to discover and interpret. In 1974, a young boy drove an old pickup truck down a long, sandy logging road through the shady swamp next to an oxbow lake, part of the Great Pee Dee River. Too small to operate the pedals and gear-stick sitting down, he drove standing up. Chip Helms, a local boy with an inquisitive mind and a thoughtful nature, liked to spend his free time in solitude, searching for archaeological sites and pondering the ancient past. He often found them along desolate logging roads like this one. When he came to a rise, Helms could see the woods on both sides of the road had been clear-cut. The landform was high and sandy. The ground had been superficially torn up by logging equipment. This would be a good place to look. He pulled over and jumped down. As he walked among the stumps and errant broken pine boughs, Helms immediately noticed a myriad of pottery sherds lying in the sand and sawdust. Some were hand-sized. Some were much larger. Among others, he came across three large sherds decorated with rows of punctations, which he was able to see would fit together, forming about a third of the rim of a prehistoric vessel. He gazed around, lost in imagination. "I pictured what it would be like with archaeologists working here. I thought this would be a great place for an archaeological dig," Helms said, recalling a daydream that would turn into prophecy. As he continued to peruse the disturbed ground, he noticed a few broken pieces of yellow and brown glazed pottery and some clay pipe stems. Helms knew they looked historic, but, as with the prehistoric sherds, he was unsure how old they were. He was determined to find out. 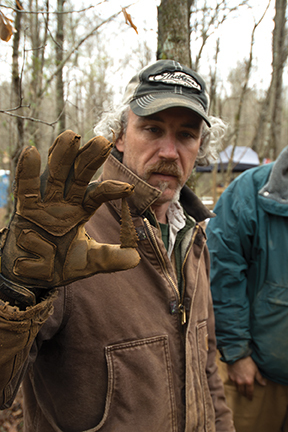 Helms took his finds to known experts in the area. At the Florence Museum, he showed the Native American pottery to archaeologist Gene Waddell (now retired from the College of Charleston). Waddell identified the sherds as Thom's Creek pottery, dating to about 4,000 years before present (B.P.) and Stalling Island pottery, dating to about 4,500 B.P. This was some of the earliest pottery made in North America. He took the other artifacts to Horace Rudisill, Director of the Darlington County Historical Commission and co-author of Darlingtonia, a history of Darlington. Rudisill identified some of the glazed sherds as yellow slipware, dating to the 1700s. 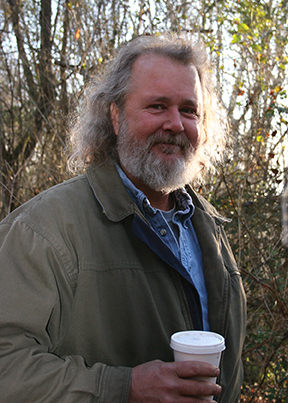 Unlike most amateur archaeologists, young Helm's goal was not to build a collection, but to identify artifacts and record sites. 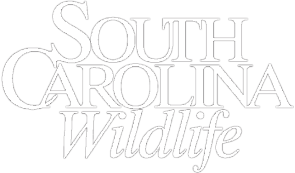 And he did so, registering the location with the South Carolina Institute of Anthropology and Archaeology (SCIAA). The site was given the number 38da75. The 38 stands for our state, the thirty-eighth state alphabetically. The "da" represents Darlington County, and it was the seventy-fifth site recorded in the county. Site 38da75 was left alone for the next twenty-three years. During that time, Helms did some research. He discovered, on a map from the 18th century, a farm located at about the location of 38da75. This was likely the home of Johannes Kolb, a founding settler of the Florence-Darlington area. 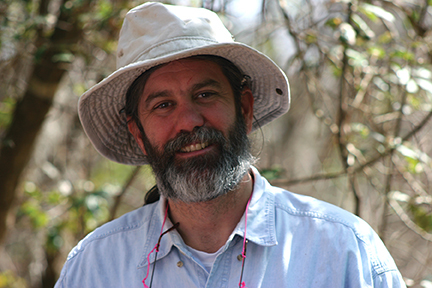 In the summer of 1997, Dr. Ernest "Chip" Helms Jr., now an oncologist, but still intensely interested in the archaeology and history of South Carolina, took S.C. Department of Natural Resources archaeologist Christopher Judge down that road along the Pee Dee to look at the site (the area had since become the DNR's Great Pee Dee River Heritage Preserve and Wildlife Management Area). Judge knew about 38da75 from reading Helms' entries in the state site files years before and had visited the site. He, too, was sure this landform, a sandy bluff in an often flooded, wooded swamp overlooking what was once the main channel of the Great Pee Dee River, was the home of Johannes Kolb during a time when the Pee Dee country of South Carolina was on the edge of America's frontier. Helms agreed to fund an archaeological dig, Judge asked colleague Carl Steen, president of the Diachronic Research Foundation, to join the effort, and a journey that would last for nearly two decades began. Five days later, Judge, Steen and four or five field technicians (including Sean Taylor, now a DNR archaeologist) descended on the Kolb Site. The plan was to find clues to isolate the location of the Kolb house(s), to investigate the Woodland period (3000 B.C. to about 1670 A.D.) component and to test the artifact density, depth and integrity (how intact it is) of 38da75. The group eventually dug fifty centimeter square holes every five meters across the entire site. Based on artifact types and densities, as well as structural and domestic features (posts, hearths, trenches, cellars, etc. ), larger two-meter squares eventually would also be excavated. During the next nineteen years, more than a thousand features were exposed, mapped, photographed, bisected, mapped and photographed again, and then removed as soil samples to be analyzed in the lab. Since the beginning of the project, archaeologists and volunteers have excavated about five hundred cubic meters, most of it in discreet five-centimeter-thick layers, and all of it shaken and pressed by hand through quarter inch mesh. 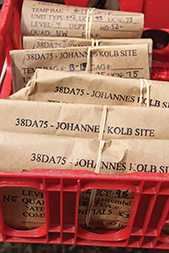 To date, the Kolb site has yielded about 1.5 million artifacts (about 75,000 on average for each of twenty visits). 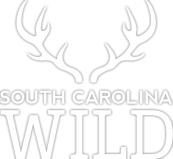 Sites boasting such high artifact densities and so many features are very rare, not just in South Carolina, but anywhere. Furthermore, aside from some logging disturbance, features and clusters of artifacts on the Kolb site are relatively intact, allowing researchers an unusually clear glimpse into our state's ancient past. 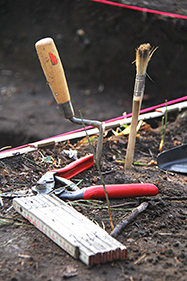 As the archaeologists investigated 38da75, in addition to finding traces of Johannes Kolb's farm, they also found 19th century artifacts and architectural features associated with slave cabins and a subsequent freedman's occupation. 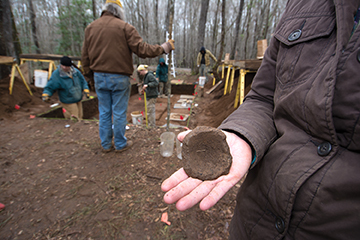 Beneath these historic components, they found a dense layer of Woodland period artifacts, structural features and organic food remains dating from 1,000 to 3,500 years ago. Still deeper, archaeologists found a layer of stone artifacts dating to the Archaic period, as early as 10,000 years ago. In subsequent years, the excavations would reveal artifacts pushing the date of the Kolb site back into the Paleo-Indian period, about 13,000 years ago. Finding an intact Paleo-Indian site is a once-in-a-career event in archaeology. Though the Woodland period and 18th century components of the site had been the original focus of the project, 38da75 turned out to contain much more than expected. 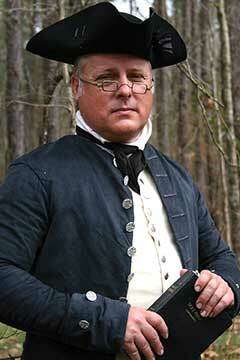 Almost every component of early South Carolina culture and history is represented at Kolb. By the second field season, a volunteer program had already evolved and continues (though in the lab, not the field) today. In the years that followed, ten to twenty students, professionals and retirees volunteered on any given day. Some came for just the day. Some came for a few days. Some stayed for the whole two-week digging season. Many returned year after year. Volunteers were an integral part of the Kolb site project. They logged 11,400 hours, and the project could not have succeeded without them. So committed were they that, in its duration, the project saw fifteen volunteers grow from students into professional archaeologists. One volunteer, Laura Steadman, was brought to the project by her mom, Molly, as a middle school student and continued being involved through high school, and on through her college years at William and Mary, where she majored in archaeology. 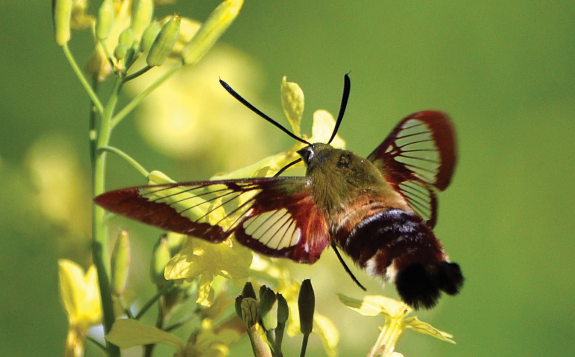 The volunteer effort extended beyond the field season and continues even now. The tens of thousands of artifacts recovered each season are being processed (washed, analyzed, cataloged, etc.) at the Native American Studies Center at USC, Lancaster. Here volunteers, under the tutelage of Judge, continue to learn about history and prehistory through first-hand experience. 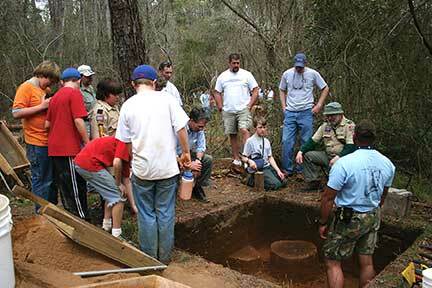 The Kolb site's public education program was active from the beginning and became stronger in each field season. Individuals, families, scout troops and school field trips visited the site regularly. Among the visitors were descendants of Johannes Kolb, living in the Darlington-Florence area and ecstatic about having archaeology done on their family's legacy. 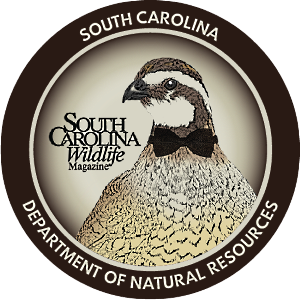 Also present on the site were members and representatives of the Pee Dee, Cherokee and Lakota Indian tribes, as well as other Native American groups. They too gave their blessings and support. Over the years, more than 6,000 visitors came to the Kolb site. Subsequently, each middle-Saturday of the two-week season was designated as Public Day. Though the public was welcome throughout the season, this quickly became the project's busiest day. Each Public Day, Emily Ligon (an original crew member from 1997) greeted visitors, organized and expedited tours of the site. A marked path through the site was lined with informative posters, maps and exhibits. 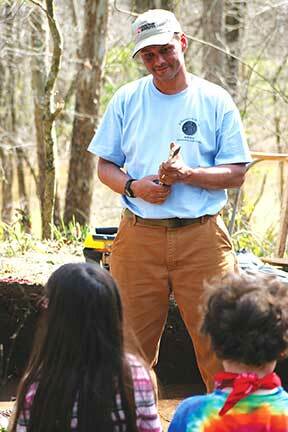 Visitors viewed open units being excavated and were able to ask questions of the archaeologists as they dug. Additionally, the DNR hired professional historic interpreters to discuss 18th century life, ancient fishing technology and African-American sharecropper culture. Special technologists were also brought in to demonstrate stone tool making, fire starting, pottery making, cooking, hide and chord making, and much more. For younger children, South Carolina Archaeology Public Outreach Division (SCAPOD) set up an activity area where kids could learn about archaeology with hands-on activities like creating their own soil stratigraphy in a bottle, and making, breaking and refitting pottery. However, March 2016 marked the end of work on the Kolb site. After nineteen years, Steen estimates about 10 percent has been excavated. That leaves about 90 percent of the site untouched. This will be left to the protection of the DNR's Law Enforcement Division, because, above all, preservation is of paramount importance to archaeology. Archaeological sites are a nonrenewable resource, and what remains of the Kolb site will be passed on for other generations to ponder and enjoy. The project continues forward in the Native American Studies Center lab and interested parties may volunteer every Thursday from 3 p.m. to 7 p.m. A Kolb site exhibit will be set up at the center on March 18th and will remain on display for the next three years for public viewing. Also, a documentary DVD, Square Holes: Digging the Kolb Site, about the Kolb site project was produced in 2015 by William Judge, so people who missed the project can still share some of the experience. This is available at the project website, 38da75.com. Additionally, Carl Steen is working on a definitive book about the Kolb site. He hopes to complete it in about five years. 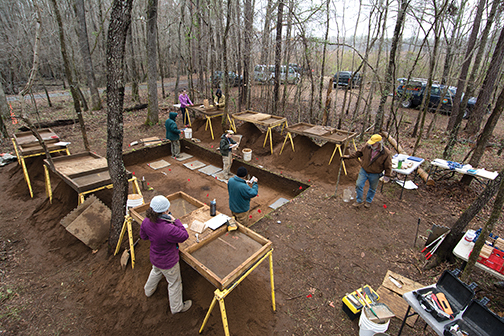 The end of the Kolb site project does not mean the end of public archaeology in South Carolina. DNR archaeologists are already considering other Heritage Trust Preserve sites for the next annual public archaeological project. Tariq Ghaffar is a DNR archaeologist.